The train station has a distinctly different energy, a vibe of anticipation, of something extra special-not another plane ride or drive in the country. The people here are not in it for the destination, rather, the journey. Represented are your railway aficionados, one fellow texting back and forth with someone on the train. 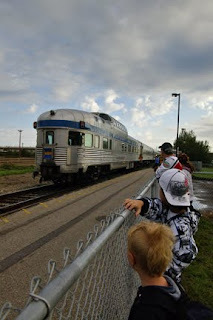 “They’re stopped by Rexall,” he shared, as Dylan, Ben and I stood, fingers curled through the chain link fence trying to be the first to spot the train. Also represented are your hippie travelers, seasoned travelers, new Canadians and old Canadians. When I was young, we would travel to Melville to catch the train, maybe an hour and a half from Kamsack. 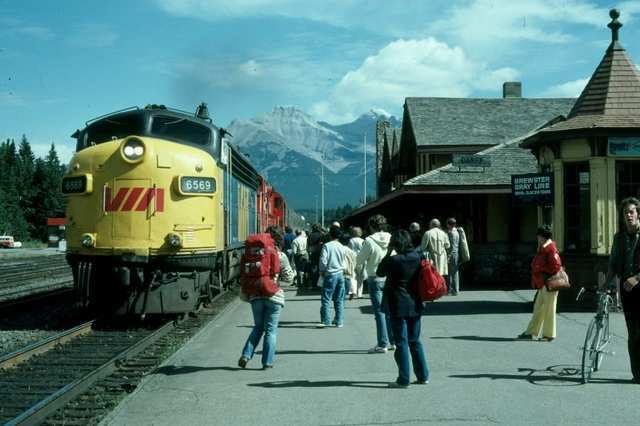 Being a minor stop in the middle of the prairie, the arrival time was always unpredictable-this, decades before you could go online to find the answer to all of life’s mysteries, including the estimated arrival time of the Canadian. So, when that spotlight appeared on the horizon, it was pretty exciting. In Edmonton, the train comes in from the east, following the Yellowhead highway that pierces through the north end of the city. Today, it passed by the old city airport and venue for this weekend’s Indy car race, going west beyond the station so that it could back into place in front of the platform full of eager travelers. “You guys keep looking for the train and I’ll snap a picture of you just as it passes,” I said as they completely ignored me, transfixed at the approaching national icon. It took probably twenty minutes before passengers were disembarked and the cars serviced before we were able to board. And while we were disappointed to not get four seats together, we are across from each other, which is just fine. The boys are already off exploring the dome car and the freedom that comes with riding the train. Heather is studying across the way while I capture these initial thoughts as we sit idle near the city limits waiting for a freight to pass. Off in the near distance, strangers are introducing themselves-being social is part of mystique of going by rail, it’s an expectation, a necessity, a gift. This is a journey of a different colour, a way of traveling that needs to be experienced to be fully understand.